If you ask a group of kids to name planets in our solar system, chances are Mars is going to be in the top 3. Mars has always been one of our faves. It’s possible that Mars is our potential ‘back up’ planet if the Earth decided to cark it or maybe it’s the allure of Arnold Schwarzenegger in Total Recall. Either way, the desert planet with its reddish glow in the night sky certainly holds our gaze and leaves us searching for more. So why the fascination with our dusty neighbour? Mars and Earth actually have a similar past, much like Earth, Mars once had water prompting the idea that where there’s water there may be life. The first concrete evidence of water on Mars started in 1984 with the discovery of a meteorite in Antarctica which revealed traces of carbonates, which need water to form, and a composition very similar to rock samples analysed on the surface of Mars back in the seventies. So, if Mars had water, it begs the question – is Mars habitable and if Martian life existed, how has it evolved. What we do know is that Mars isn’t your average postcard-paradise. With winds up to 400km/h, there is no protection against cosmic radiation, it’s pretty unlikely that there are little green men chilling on the sand banks but rather life in the form of microbes. With the big question being ‘was Mars once wet?’ NASA announced the first Rover mission to Mars called ‘Pathfinder’ which successfully landed with its microwave oven sized rover call Sojourner in 1997. Results from that rover were similar to those of the Viking lander missions in the seventies which showed Mars to be a dry planet. Images of the Martian surface using orbiting spacecraft though showed clear features that strongly suggested that water had once flowed across the planet. Enter Spirit and Opportunity, two rovers that landed on opposite sides of Mars – with significant help from yours truly, and the telecommunications expertise of the Deep Space Network (DSN) at the CSIRO-managed, Canberra Deep Space Communication Complex (CDSCC). CDSCC was the first station to have contact with the spacecraft shortly after their respective launches in June and July 2003 and was NASA’s Prime station handling communications during the entry, descent and landing phases for both missions in January 2004, and brought back to us one third of all data from those rovers during their missions. 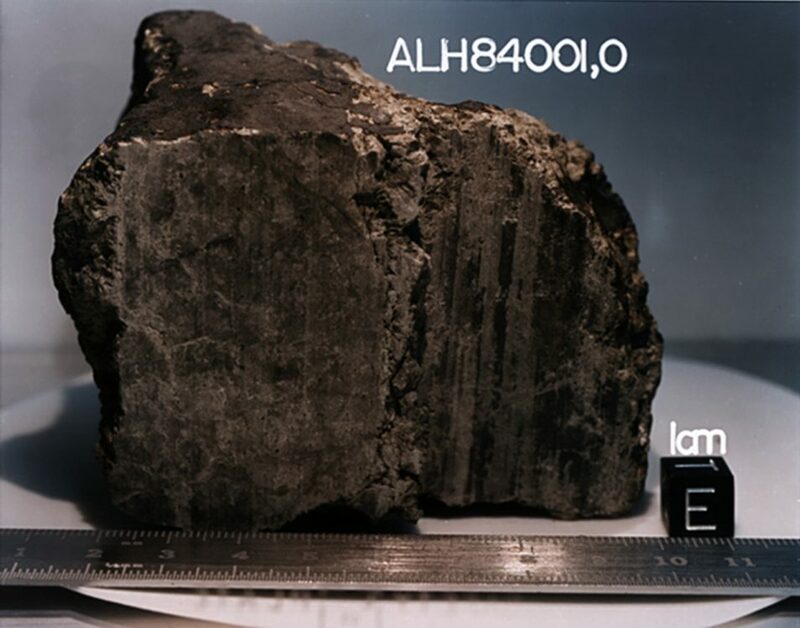 While initial results from Spirit showed similar findings to the Viking mission, a breakthrough came from Opportunity (Oppy) with the discovery of jarosite and hematite: two minerals that need water and acidic conditions to be formed. 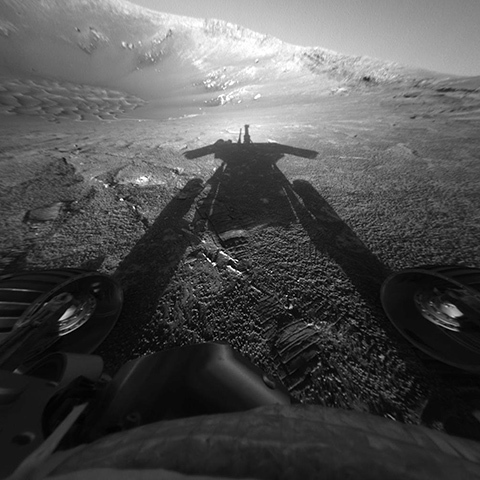 NASA’s Mars Rover Opportunity catches its own late-afternoon shadow in this dramatically lit view eastward across Endeavour Crater on Mars. Photo credit: NASA/JPL-Caltech/Cornell/Arizona State Univ. Oppy and Spirit lived well beyond their use by date of 3 months and a desire to travel up to 600 metres across the surface of Mars. 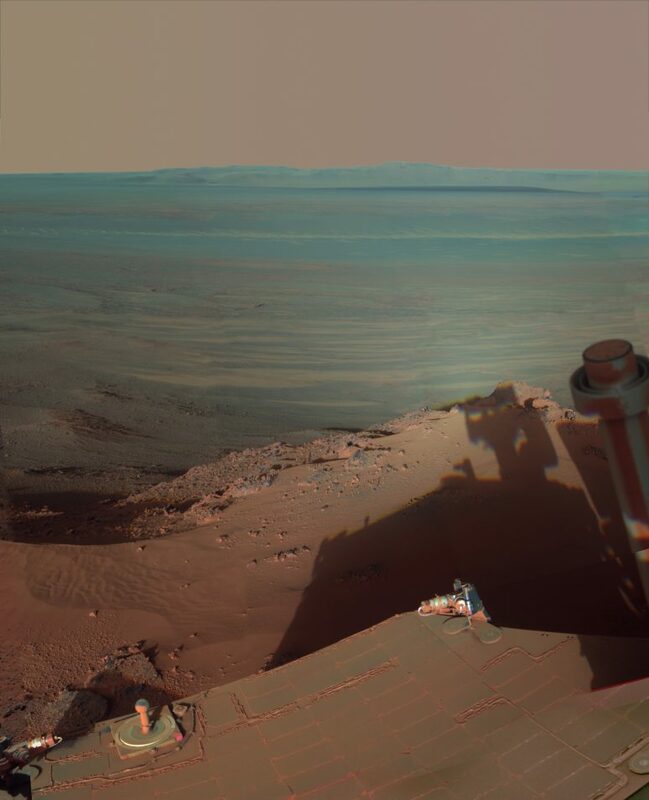 Spirit pushed on for a further six years and nearly 8 kilometres of driving and Oppy pumped out data for a further 15 years and covered over 45 kms on its voyage of discovery. The rovers transformed our knowledge about the past environment on Mars and proved that not only was Mars was once wet, but that there were once oceans on Mars as salty as the Dead Sea, plus there were hot springs and fresh water streams. Affected by a global dust storm on Mars which prevented sunlight from reaching its solar panels, communication was lost with Oppy in June 2018. Once the storm abated, CDSCC and the DSN had been providing communication support as part of NASA’s recovery efforts. Over the next 8 months, 800 commanding and acquisition attempts were made through the DSN, using every conceivable scenario to account for the possible conditions that the rover could be in. During the final few hours of the mission, after all other attempts had failed, the DSN transmitted a number of final uplink commands to Oppy, a series of “Hail Mary” passes being made by the mission team in a last-ditch effort to reacquire the rover. Even after that series of desperate commands failed to get a response, the mission team, still ever hopeful, asked CDSCC to continue to just keeping listening for an extra 15 minutes, just in case Oppy would call home at the very last moment.. It was clear that they wanted to keep trying right through to every last second of available antenna time, and until all hope was exhausted. Sadly, no response was received. A few moments after “time” was finally called on the Opportunity rover, the MER (Mars exploration Rovers) Project Manager, John Callas spoke to our DSN team through NASA’s internal communications network, with a final message on the end of mission. While this mission is over, the legacy of Opportunity and Spirit lives through the copious amounts of data provided for further investigation. We also continue to support eight other missions currently active on Mars, including six orbiters and two surface vehicles; the Curiosity rover which has been operating on the red planet for six and a half years and the InSight lander which touched down on Mars last November. We are also gearing up for NASA’s next rover mission, Mars 2020 and preparing for four other spacecraft planning to arrive in orbit or on the surface of Mars in 2021. Why wouldn’t water on Mars be locked up in permafrost the same as it is in Siberia and Canada. We know as it thaws methane is released, perhaps that also happens on Mars. A great article – thanks for the update – and great photos!